With the advent of technologies designed to make life easier, diagnostic tools for cars have become more of a necessity and not just a luxury. Automobiles operate on a delicate balance, and monitoring the correct running of an automobile is important in discovering, addressing and preventing faults which could lead to accidents. This need is filled by automotive scanners. Automotive scanners are “electronic tools used to interface with, diagnose and reprogram vehicle modules”. This is a fancy way of saying that automotive scanners work with the vehicle to tell you when there is a fault, what can be done about that fault and sometimes even fix the fault. 1 Introduction : What Are OBD2 Scanners? 3 How Do OBD2 Scanners Work ? Introduction : What Are OBD2 Scanners? On-Board Diagnostics (OBD) is a self-diagnostics system formulated by the California Air Resources Board (CARB) according to specifications laid down by the American Society of Automotive Engineers (SAE). This system works by using a car’s onboard computer hooked up to a standardised, external self-diagnostics system (which is compatible with the vehicle involved) to report on the state of the vehicle’s mechanics and detect faults when they arise. The earliest OBD systems (designated OBD1) had to be adapted to suit different car manufacturers. The newer OBD2 systems have been upgraded to use the same communication protocols, code designations and connectors for all the car manufacturers. Thus , a single OBD2 scanner can provide the desired data required across all makes and models of cars produced in and after 1996 (the year OBD2 requirement for all cars was implemented), making it more universal and easier to use. This eliminates unnecessary waste of resources in the maintenance of vehicles of different types and streamlines the process of automotive diagnostics so that even an inexperienced user who wants the DIY experience can undertake diagnostics successfully with the use of the best OBD2 scanners. Code readers can read and clear codes from any OBD 2 enabled vehicle. They are limited in this function in that after reading the faulty vehicle codes, an experienced mechanic or a manual would still be needed to interpret the codes and proffer solutions to the errors. They just provide basic information. Scan tools are more varied in function, and thus more expensive. The user is given access to a wide range of features including manufacturer-specific codes, a database of information to draw upon when there are faults and specific fixes for code errors. 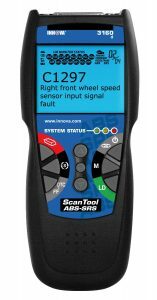 Due to this comprehensive function, scan tools are a well rounded diagnostic tool able to be used even by an inexperienced vehicle owner with ease. How Do OBD2 Scanners Work ? OBD2 devices are equipped with several features that are determined by what class they belong to: scan tools or basic code readers. Either way, their interaction with the vehicle is accomplished in the same way. OBD2 enabled vehicles to have ports, activation centres and sensors in strategic positions all over the interior of the car. This enables them to monitor the proper functioning of the vehicle and control engine functions through the onboard computer, taking regular readings of both normal and abnormal activities of the vehicle. This it does by taking regular readings of different systems in the car including the engine, chassis, frame and other parts of the car. These readings are then charted against a pre-determined and standardised set of codes that represents different areas of the vehicle’s functionality, and abnormalities are easily spotted and reported as error codes. All the information gathered is stored in the system and can be assessed by attaching a computer or smart device to the port and downloading the codes. This makes it so easy to pinpoints faults and under what conditions the damage or malfunction occurred. It also makes implementing a specific solution easy, eliminating generalised hail-Mary fixes that might do more harm than good. Some OBD2 scanners even have support hotlines that can provide technical help to car owners and mechanics, while others are equipped with comprehensive user manuals even in the form of interactive videos, which the user can access and follow the instructions step by step to repair the noticed fault. Both professional mechanics and DIY-enthusiasts could find an OBD scanner invaluable in their arsenal of tools, even though the expensive, high-end scanners could be unnecessary and too expensive.instead of spending much on a high-end OBD2 scanner, the technician could scout for cheaper alternatives available online or even in automotive part stores. More difficult fixes can be left to a professional or the needed step-by-step information for correcting the fault can be accessed on any available companion manual if it is provided. Before choosing a scanning device, it should be clear what type would perform the needed function-a basic code reader or a more high-end scan tool, bearing in mind that the basic tools have the most compatibility issues and do not have the programming to cover more sophisticated protocols like an high-end device would. OBD2 enabled vehicles use at least one of the following protocols: J1850 PWM, J1850 VPW, ISO 9141-2, ISO 14230-4 (KWP2000) and CAN-BUS (J1939 & ISO15765-4). Users are advised to check the vehicle protocols before making a choice of OBD2 device to buy to make sure that it is compatible with the desired device and to determine whether a basic code reader would cover the functionality or a high-end device would be more appropriate. This protocol is provided on a label under the vehicle’s hood and in other strategic positions in the car. It can also be accessed on the Internet by searching for the vehicle specifications on the OBD2 scanner manufacturer’s database. A basic understanding of the above explanation is enough to help you narrow your choice to the best, just as we have in the reviews below. However, you must also take into consideration the necessary market buying considerations, which include design, appearance, durability, customer support and even price. The best ODD2 scanners contain the perfect blend of functionality and affordability. Based on our three-step process , here are the top 10 best obd2 scanner you should consider buying. BAFX 34T5 OBD2 SCANNER is Android and Windows (but not iOS) Bluetooth-compatible and connects to vehicles that are OBD2 enabled (manufactured in the USA from 1996 or later). It works by connecting via Bluetooth to your phone, tablet or windows PC, delivering real-time data about the car’s diagnostic state. The device requires download of a third-party application, which can be bought at the Android or Windows store, the most recommended of which is called “Torque” . 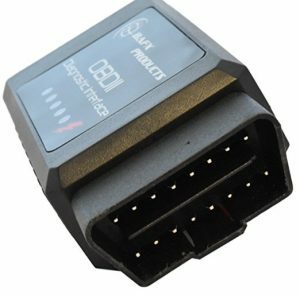 The manufacturers do specify that customers outside the USA can ask if their countries and cars are supported by the BAFX OBD2 device. It makes it possible to read and clear “diagnostic trouble codes” (DTC) and also to read data on engine functionality like vehicle speed, long term fuel trim, short term fuel trim, timing, advance intake, air temperature and flow, oxygen sensors and much more. 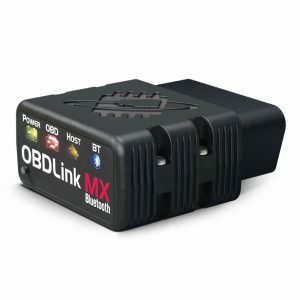 This Bluetooth OBD2 scanner works with any OBD2 compliant vehicle manufactured by any company. It supports all OBD2 protocols which make it one of the best OBD2 scanner on the market. The BAFX adapter lasts longer, has more stable connections. Works smoother on all vehicles more than any other scan device available. Its low cost and high functionality in relation to other more expensive, yet less functional devices make it stand out. Does not need professional qualifications to be used. Works on all OBD2 devices and compliant vehicles. The device is unwieldy in size and does not support SW-CAN (GM). It is also not available on iOS and doesn’t offer enhanced code reading. BAFX SCANNER TOOL stands as the highest rated and best-selling OBD2 scanner on Amazon with an impressive average of 4.5 stars out of 8,366 reviews holding strong, a testament to its high performance and functionality. 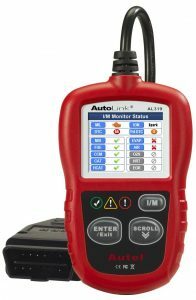 The AUTEL MS300 plug-and-play device retrieves and interprets both generic and manufacturer specific diagnostic trouble codes (DTC) when accessed through its companion computer. The OBD2 scanner comes equipped with definitions lookup software on a CD, making repair and understanding of the codes easier for the user. It has an easy to use button design and is equipped with a cord and so there is no need for external hardware in using the device. It has an easy to read LCD screen display and multilingual menu available for non-native English speakers. It reads and erases DTC including generic codes, pending codes and manufacturer codes on all American, Asian and European vehicles. It also Supports CAN protocols and other existing OBD2 protocols on most OBD2 compliant vehicles. This OBD2 brand retrieves vehicle identification number (VIN) on newer vehicles which are Mode 9 enabled. It weighs about 10 ounces, relatively small for ease of use and navigation. The CD carries more than 7000 diagnostic codes and their meanings and fixes, making retrieval of such information by the user interactive and easy. It also instils a sense of safety in the user. It has a wide compliance with most vehicles that are OBD2 enabled. The device is cost effective when compared to other OBD2 SCANNERS available on the market. Its wide usage comes in handy for imported vehicles. It comes as a standalone tool and so cannot be upgraded. For users who desire more features, the device is not ideal as it is more basic. It is limited to data stored on the computer, and so action taken by the user depends on when the on-board diagnostics are accessed. AUTEL MAXISCAN MS300 OBD2 scanner averages at 4.2 stars out of 5,527 reviews, a feat which is possible due to its high performance and user-friendly features. 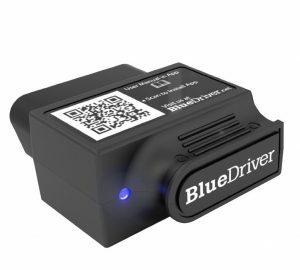 The BLUEDRIVER OBD2 scanner is highly recommended especially in the United States because it was built by automotive engineers and so comes with features that anticipate and fill the needs of mechanics. Its data be accessed on both Android and Apple devices and it integrates the multi-functional high-end scan tool features with your smart device both handheld and tablet, allowing for quick and convenient fixes, code updates, data saving and exporting to other devices and viewing of live data. RepairReport feature, which is an online support and help database filled verified by real automotive technicians who provide help, fixes and information on vehicle diagnostic problems to BLUEDRIVER users. Repair Report is vehicle-specific and contains valuable information such as code definition, possible causes of vehicle faults and reported fixes. For the optimal total experience, the BlueDriver Sensor and the free BlueDriver application on iTunes and Google Play store are designed to work together as a single tool. The device also has the freeze frame feature that takes a snapshot of the car’s diagnostics at the time a code is reported and stored. The device supports all OBD2 protocols. The device reads and clears a wide variety of codes. It offers several advantages, some of which include its companion application available both for iOS and Android. Bluetooth connectivity is optimal on this device. Free repair guides and full OBD2 support is available for inexperienced users. Comprehensive repair and data reports are available without the use of an external system. The device is easy to set up and use. Code availability on Bluedriver devices may be limited. Live data is not available for all makes and models. The device is expensive when compared to other models of scan tools available. It has been reported that the device is prone to connectivity problems. With some older devices, some functions have to be gotten from the app store and are not free with a purchase of the OBD2 device. BLUEDRIVER is a highly rated professional diagnostic scan tool, with Amazon rating at 4.5 stars out of 1,696 reviews. The PANLONG device is desirable more than most OBD2 devices because it reads and records real-time data from vehicles and indicates when there is a problem to be diagnosed. It is plugged into the vehicle’s OBD2 port and reads data sent by the vehicle’s diagnostic system, detects when there is a problem in those systems and provides a solution to those problems. It works on any OBD2 compatible vehicles manufactured in 1996 or newer. The device pairs with its companion application which can be gotten on the AndroidPlay Store. It makes the user able to monitor the vehicle’s sensors, RPMs, speed, the temperature of the engine and other parameters that are not readily viewable on the vehicle’s dashboard. It enables the user to get ahead of faults by indicating when the engine is faulty and why it is faulty before a visit to the mechanic. Diagnostic trouble codes both generic and manufacturer-specific can be read and their meaning interpreted. The device has an easy to use USB port system and uses Bluetooth enablement to download the vehicle’s diagnostic codes onto the android device. Recommended applications include Torque Pro, Torque Light, OBD Car Doctor etc. available on Google Play. It works with all OBD2 enabled cars manufactured from 1996 and newer. Full OBD2 support available for OBD2 enabled vehicles is offered by the device. The customer care service is also available, friendly and professional. There is a 100% money back guarantee and a one-year replacement warranty for dissatisfied users. The PANLONG BLUETOOTH OBD2 scanner is incompatible with iOS and Windows 8 devices. It has a flimsy build, as the weight is at 0.3 ounces. Some connectivity issues have been reported. 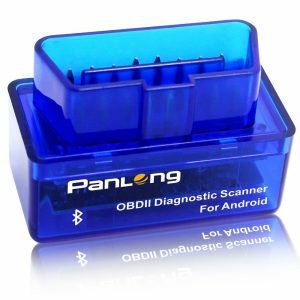 PANLONG Bluetooth OBD2 scanner is a highly reviewed product at an average 4.2 stars out of 1,411 reviews. Many professionals automotive engineers who need advanced functions without all the hassle of learning to use a new tool use INNOVA 3160E scanner. It features advanced functionality such as live data, airbag diagnostics and optional Repair Solutions, which is a web-based service that was created to assist technicians in diagnosing and fixing modern vehicles by service providers who give professional information on repairs, repair costs, difficulty ratings of repairs and more information. Live data streaming and recording is available on this device. It also features diagnosis and erasure of anti-lock braking system codes on most OBD2 enabled vehicles. With a convenient, patented on-screen and easy to use HotKeys, it is ideal for users who do not have technical training and still works to assist professional technicians, saving time and money for them both. Prompt diagnosis, repair and erasure of the causes of “check engine” light on both domestic and imported OBD2 enables vehicles of all kinds, including hybrid vehicles. The device reads air bag/supplemental retrieval systems (SRS) in newer vehicles including hybrids. Its patented one screen display function is available in English, French and Spanish, showing up to 20 pieces of vital information all at the same time. Live data can be streamed for real-time viewing or recorded to be analysed at a later time. The OBD2 scanner comes with yellow, green and red LED display lights to indicate emission monitor status and indicate problems or the lack of it. It also comes with a freeze frame function which displays the fuel trim, engine temperature, etc at the time the malfunction indicator lights (MIL) came on. There is also an inbuilt beep indicator to confirm connection of the OBD2 device to the vehicle, and low battery indicators to prompt charging or battery replacement of the device. The device is packed with many desirable features, which makes it multi-functional. Customer support is available in both English and Spanish from Monday to Saturday. It is easy to use and operate. One year limited warranty if the device is free from defects. It is way too expensive compared to other OBD2 scanners. The INNOVA 3160E OBD2 scanner and averages at a 4.5-star review out of 1,054 reviews, which is not surprising as it is packed with user-friendly features. This INNOVA product provides its users with a quick and easy way to keep up with vehicle diagnostics and repairs when problems arise. It can be used by both amateur car owners and experienced mechanics on all OBD2 compatible vehicles manufactured after 1996 because of its ease of use, saving time and money. The INNOVA patented all-in-one screen and easy-to-use HotKeys and RepairSolutions, the web-based service that assists technicians of all levels to accurately and promptly diagnose and repair their vehicles, providing verified fixes, repair costs, difficulty ratings of different fixes and more. The OBD2 scanner reveals and fixes check engine light notifications on all OBD2 enabled vehicles. The device reads and erases ABS and SRS light trouble codes on most vehicles and has an oil reset feature that provides step-by-step reset procedures for most OBD2 enabled vehicles. It also has the freeze frame feature which shows the appropriate engine conditions such as temperature and engine conditions at the time of malfunction and activation of the Malfunction Indicator Light. Battery and alternator tests check the performance of the vehicle’s charging system. The maintenance minder system shows engine oil life with a display light to indicate when the engine oil should be replaced or when the engine is due for maintenance. The device even comes with step-by-step procedure manual which can be used to change the engine oil. All the features are available on one screen and can be easily viewed to monitor emission readiness. The HOTKEYS are easy to use, for erasing trouble codes and jumping between menus, making it ideal for DIY users. Its oil light reset saves money. Some repair solutions on their website need purchase and need a certain level of experience for the user to be able to conduct the fixes involved. It also does not support live data streaming to the user’s devices. INNOVA 3100J OBD scanner tool is popularly demanded and favourably reviewed at an average of 4.5 stars out of 938 reviews. SCANTOOL’s OBD USB device is an easy-to-use a diagnostic tool, effective, inexpensive and saves time. 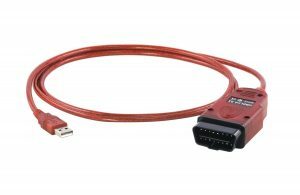 Its UBS 2.0 port interface just needs to be plugged into the vehicle’s port to turns the user’s tablet or Windows Vista laptop into a real-time vehicle performance monitor. It quickly and accurately diagnoses vehicle problems and accesses performance parameters for all vehicles supporting OBD2 protocols and works on cars manufactured from 1996 or newer. It also supports the international variants of OBD2 (EOBD and JOBD), even though it is not Ford MS-CAN and GM SW-CAN enabled. It makes it possible for the car owners to check diagnostic codes and make repairs. The SX model connects to more OBD2 compliant vehicles than most scan tools. Its’ fast connection speed enables it to provide smoother graphs and real-time gauges of a vehicle function. Data can also be stored for reference purposes and erased when they are no longer necessary, and the freeze-frame feature is available to assess the condition of the vehicle’s engine and diagnostics at the time of malfunction and code activation. The display feature can graph and log up to 90plus real-time parameters and custom digital dashboards displaying the user’s preferred diagnostic parameters can be created. It also has a battery saver feature which does not drain the car battery. The device measures and displays fuel economy. The OBD2 scanner supports single-wire CAN (GMLAN) and Ford medium-speed CAN (MS-CAN), and has a large CAN vehicle buffer which makes it stable. Supports all OBD2 protocols including J1850 VPW AND J1850 PWM specific to Ford vehicles and ISO9141-2 which is supported by European and Asian vehicles. Supported devices are smartphones and tablets with Android 3.1 software and newer, and Windows devices on PCs and tablets with Windows XP SP2 and newer operating systems and a viable USB port. Companion applications include Torque Pro, OBDLink, DashCommand and Harry’s Lap Timer. There is a three-year warranty on the device, and a 90-day money back guarantees for dissatisfied customers. It transforms the user’s computers into a user-friendly diagnostics system. It also reads DTCs and Malfunction Information Lights and erases trouble codes if required. Freeze-frame information is easily accessible. Has high voltage protection to protect the device from an explosion in case it is disposed of at an incinerated dump site. Battery sleep mode saves power. It is relatively cheap compared to other devices. Electric cars and hybrid cars cannot use this device. Requires a laptop for reading data, which can be inconvenient. Scantool’s OBDLink SX USB scan tool stands at 4.5 stars out of 875 reviews on Amazon. It is a compact Bluetooth-enabled OBD2 device that works with all OBD2 compliant vehicles (except for hybrid or electric vehicles). It takes 3 minutes to install, which is convenient and easy.The device is multi-functional as a scan tool, logger and real-time performance monitor for the cars and is up to 300% more effective than other scan devices available. It is compatible with many third-party OBD software and mobile apps on Android, Windows and Blackberry devices. It reads and erases trouble codes both generic and manufacturer-specific, accesses freeze-frame information and can display up to 90 real time parameters like engine capability, fuel economy and other diagnostic information. It is Bluetooth enabled and supports all OBD2 protocols including single-wire CAN (GMLAN) and Ford Medium-speed CAN (MS-CAN) and also international variants of OBD2 like EOBD and JOBD. It also offers a lot of third-party applications and software options, and free firmware updates included in the package. The device also has maximum vehicle coverage and battery-saver mode. It also features a unique, multi-layered security masking it from view, unlike other devices which can be viewed by any smartphones in the vicinity and use an easy-to-guess four digit pin. This makes it very difficult to be accessed by unauthorized users. It comes with a 90-day money back guarantee to ensure customer satisfaction and a three-year warranty. Battery saver feature makes it desirable. Compared to other available OBD2 devices, its data transfer function is fast and eliminates lagging. The third party application can be swapped out for a custom application like Torque available on app store. It also has a battery-saving function which makes it able to be plugged in overnight in the car and will not drain the car’s battery. The device causes engine shut-down in some Ford vehicles. It is not available on iOS. Some faulty scanners have been reported by independent car owners, although the SCANTOOL customer care was quick to respond and replace the faulty devices. SCANTOOL MX is competitive and budget-friendly when compared with other diagnostic scan tools with an average of 4.5 stars out of 764 reviews. KOBRA wireless OBD2 car code reader is an automobile diagnostic tool manufactured by Goliath Industries that uses wi-fi to connect to android, iOS and windows devices, and boasts of helping diagnose any car trouble and saving money, in addition to being easy to use which makes it ideal for inexperienced, DIY users with no technical experience. KOBRA is compatible with most cars and trucks in the United States of America so far as they are OBD2 enabled and manufactured from 1996. Customers from other countries need to contact KOBRA customer care to get information on the OBD2 compatibility of their cars. The car’s on-board computer offers a real-time feed of data streaming from the car, giving the user a complete picture of the inner workings of the car and highlighting any faults so that pre-emptive strike can be undertaken to manage and eliminate car trouble. It offers a wide variety of code definition database and is very effective and offers wide functionality. Its LED indicator display reads and displays the meaning of both generic and manufacturer-specific diagnostic codes, more than 3000, in fact. This device uses various third-party applications, both free and paid including Torque pro for Android and OBD Car Doctor for iOS. The device has also been recently upgraded to include improved wi-fi signal range, enhanced application compatibility and upgraded components. The OBD2 scanner is cheap when compared to other devices on the market. Transfer of data to the phone is faster via wi-fi and is reported in real time, and it supports most OBD2 protocols available. The scanner does not support SW-CAN (GM) & MS-CAN (Ford). This KOBRA device is highly reviewed with an average of 4 stars out of 701 reviews. The AUTEL AUTOLINK OBD2 scanner works on most OBD2 compatible vehicles both domestic and imported so far as it was manufactured after 1996. It has the unique feature of the patented one-click I/M readiness key for quick state emissions readiness check and drives cycle verification. It features both a multilingual visual and audible indications, as it has both a LED screen and built-in speakers. When the Malfunction Indicator Light comes on, it easily determines the cause of the malfunction, and the light can be automatically turned off and the codes reset. Data can be freeze-framed for review, and the display features all the parameters displayed at once, eliminating the need to scroll. The device is easy to use and reliable and can be updated via the internet. It enables users to verify repairs, perform road tests, check State Emission Monitor Status and solve basic engine and drivability problems. It can be powered externally via the vehicle battery. It retrieves all manufacturer specific codes, generic and pending codes. The OBD2 scanner reads live PCM datastream and retrieves vehicle VIN, CIN and CVN data information. The device is small and easy to handle. OBD2 readiness displays in under a minute and the device has a large screen for better readability and to minimise scrolling. The OBD2 device has a multilingual feature which makes it desirable in several countries. It comes with accessories for is functions – a CD, USB cable and user manual which make it easy to use. The fact that updates are no longer available and its short OBD2 cable makes it less desirable. Also, a warranty is not available on the device. Even though it is the last on this list, this OBD2 scanner is still highly recommended at 4.5 out of 664 reviews. There is no substitute for the best but apart from these highly reviewed and much sought after best OBD2 scanners, honourable mention has to be given to some OBD2 devices which have also been well-received in the automotive industry and are also widely used. They include AUTEL AL519 AUTOLINK ENHANCED OBD2 SCANNER TOOL (529), ACTRON CP9580A ENHANCED AUTOSCANNER PLUS (326), ERSUN BLUETOOTH MINI OBD2 SCANNER, iSADDLE WIFI WIRELESS OBD2 SCANNER AND INNOVAS 3030 AND 3040 SCAN TOOLS. 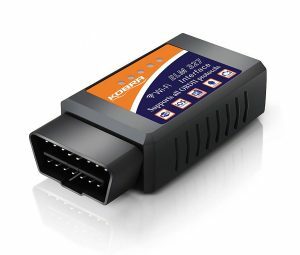 Hope you’ve been able to select the best obd2 scanner for your car. Best obd2 scanner , Obd2 Scanner Reviews , Best Obd2 Scanner , Best Obd2 Scanner 2018 , Best Obd2 Scanner for my car , What is the best obd2 scanner 2018?